Baby's head for a birthday party or a photo shoot for something like a baby being born. Mom to be on a photo shoot for maternity photos. Bride to be for her wedding, or even an engagement party or part of the wedding celebrations leading up to the wedding or day of wedding. Baby shower gifts and bridal shower gifts for the mom or bride to be. Bridesmaids or flower girls in the wedding party. 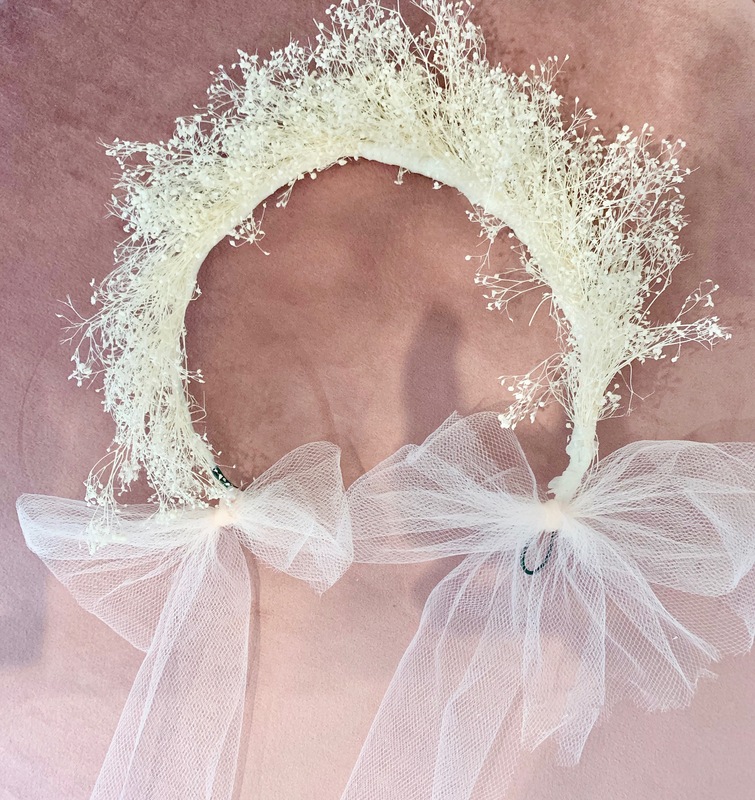 We can create dried flower crowns and dried floral headbands for you by emailing us at ali@fetesdefleurs.com. Or if you want to check out the options that we have on our e-commerce site you can do that here over at flowercrownbar.com. 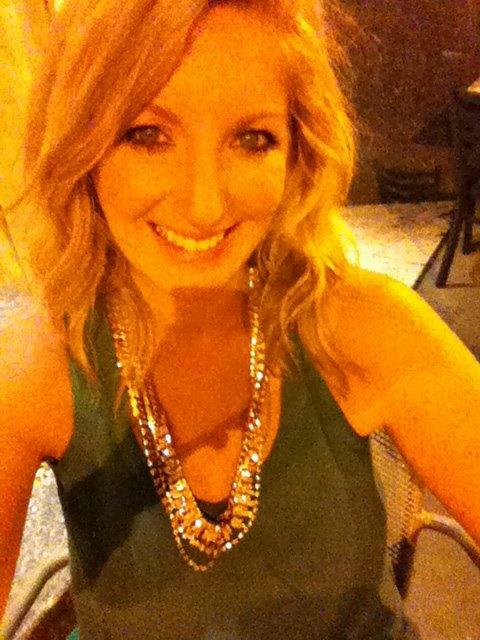 Tell us if you would like the back open to be tied together on the head with a ribbon or some other closure. Fully secured in the back and there is no opening. Would just place the dried flower crown on your head for this option. No ribbon closure in the back. If you measure your head or the head of the person who the dried flower crown is for we can make the flower crown so it fits perfectly. 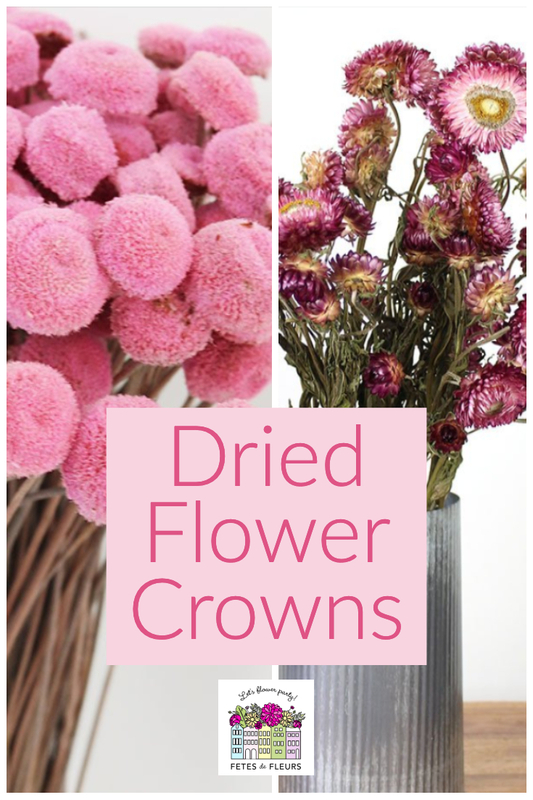 There are lots of different kinds of dried flowers that look really great in a dried flower crown. I am partial to dried baby's breath in a dried flower crown. The best thing about baby's breath dried out is that you can spray paint the dried flowers other colors like a gold color, rose gold, etc. So if you have something fun you want done we would be happy to do this for you! 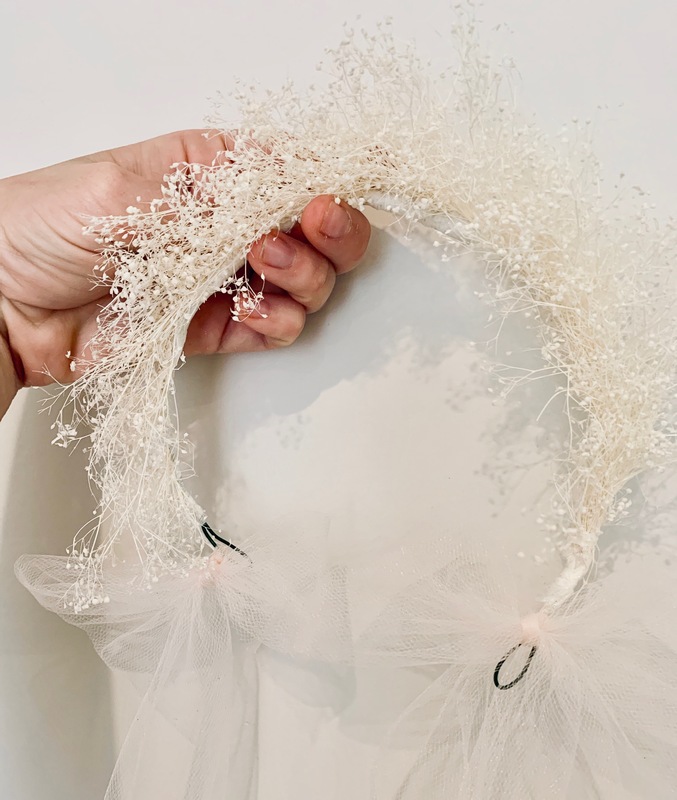 Baby's breath- you can spray paint these beautiful buds to create colored dried flower crowns. Think of spraying baby's breath with light pink, hot pink, rose gold or gold to make a statement for your celebration or wedding party. Grasses- there are so many amazing grasses like pampas grass and dried bunny tail. 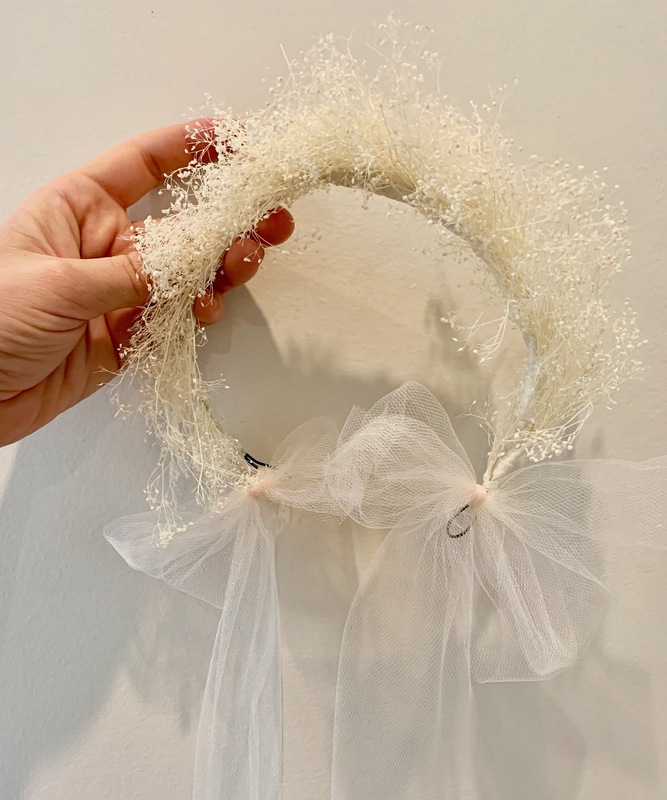 Adding grasses into the mix for a dried flower crown or any other dried flower accessories for the hair or floral jewelry is so pretty and whimsical. Blue thistle- gorgeous globe thistle / spiky echinops in blue and green colors are perfect for adding into a dried floral bouquet or dried flower hairpieces. Lavender - lavender dried out is lovely in a flower crown. A pop of light purple and the way this dried flower sits in a custom dried flower crown is beautiful. Billy buttons- these are little pops of colors in the form of a fun little ball. Strawflowers- these little pink babies dried out are perfect for adding into a dried flower crown. Spray roses- spray roses dried out are so pretty and work to add in a bigger floral into the dried flower crown. You can request custom orders for a boho celebration including dried flowers and dried florals from us at ali@fetesdefleurs.com. 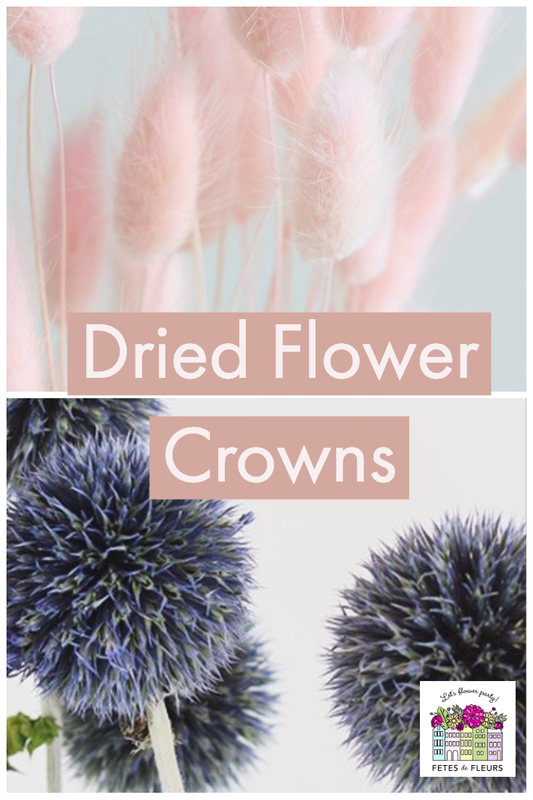 You can also visit our online shop to see what good dried flower accessories and dried flower crowns we have in stock over on our e-commerce part of our business called flowercrownbar.com.